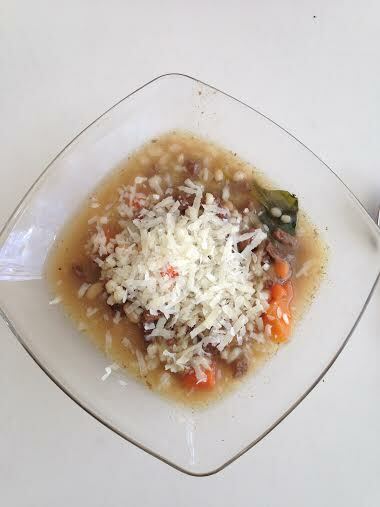 It is always good to remember that you can add almost anything to a soup but I like this soup plain. 1 1/2 pound of diced beef. I use an inexpensive cut like chuck because it has a good flavor. 3 big marrow bones. The marrow gives another great flavor. Heat three tablespoons oil in a good size soup pot. Sprinkle salt and pepper on the marrow bones and slowly brown on all sides. Add enough water to cover the bones, bring to a boil and then simmer. The marrow should melt out of the bones. Set aside and chill, then remove the top layer of congealed fat. 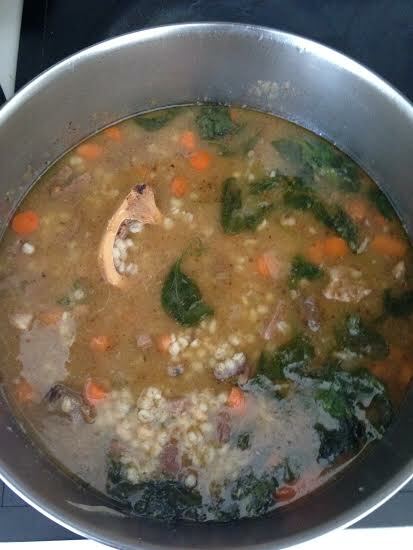 Add the meat, bones and broth from the bones, vegetables, bay leaf, water, bouillon cubes and beef broth. Boil the barley in the salted 3 cups of water till chewy about 30 minutes. Most of the water will be absorbed. Let simmer for one hour then remove the bay leaves. I leave the bones in the soup just because they look weird. Serve with grated cheese and some crusty bread.